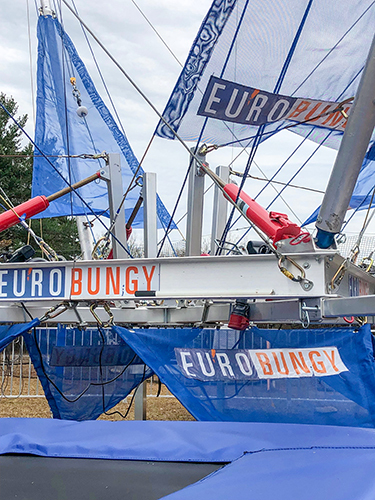 Blog: The Euro Bungy Trampoline is Back! The Euro Bungy Trampoline has returned to Treehouse World for the 2019 Season and we are “jumping” up and down, beyond thrilled, some of us are even “flipping” out over it! Children as well as adults enjoy soaring up towards the sky, doing somersaults, back flips, karate chopping the air, etc. Our Bungy Trampoline has 4 individual trampoline stations so you can compete against your friends on who can go higher. Can you jump to 25’ in the air? The Bungy Trampoline is geared for ages for 2+ with a minimum weight of 20 pounds, maximum weight 200 pounds. Our trained and certified Adventure Staff will fit you into your harness. The Adventure Staff at Treehouse World enjoy seeing the smiles and hearing the laughs but most of all creating experiences and memories for our guests. This is a GREAT activity for Birthday Parties & Group Events. The Bungy Trampoline is also available during our General Admission hours. Come soar to new heights with us!